Finance Bill 2017/Income tax amendments w.e.f 1st April 2017/Income Tax Act/Assessment Year 2018-2019. Finance Bill 2017 has been passed by both the house of parliament and after receiving the accent from President on 31st March 2017 has become Finance Act 2017. We have listed down important changes under Income Tax Act which shall be applicable from 1st April 2017 i.e. Assessment Year 2018-2019. 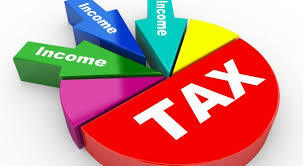 The tax rate on income between Rs.2.5 lakh to Rs.5 lakh has been reduced to 5% from earlier 10%. It will reduce the tax by 50% for people having income ranging 2,50,000-5,00,000 and other taxpayers with higher income shall get benefit of Rs.12,500. The Tax Rebate u/s 87A is reduced to 2,500 from Rs.5,000per year for taxpayers with Income up to Rs.3.5 Lakh (Earlier Rs.5 Lakh). The taxpayers whose annual taxable income is Rs.3.5 Lakh, shall be required to pay Income tax of Rs.2,575 instead of Rs.5,150. Surcharge at 10% of tax is levied on persons with income ranging between Rs.50 lakh to Rs.1 crore.The rate of surcharge for the super-rich, with income above Rs.1 crore, will remain 15%. For Non Cash Sales : Net Profit will be taken at 6% of Turnover. Delay in filing of Income tax return for 2017-18 will attract penalty of Rs.5,000/-if filed by December 31st 2018 and Rs.10,000 if filed later. The limit for payment of expenses by Cash U/s 40A(3) (for both Capital and Revenue expenditure) has been reduced from 20,000 to Rs.10,000per day in aggregate per person. Expenditure in excess of given limit would be disallowed. Even the capital expenditure incurred would not be treated as cost incurred for depreciation purposes. The limit for receipt of amount in Cash has been prescribed as 2,00,000.No person shall accept amount of Rs.2,00,000 or more by Cash either in one transaction or from one person in aggregate in a day or in relation to one event or occasion from a person. In case of default equivalent penalty shall be leviable U/s 271 DA of Income Tax Act. Cash donations exceeding Rs.2,000 will not be eligible for deduction under Section 80G. Existing TCS provisions requiring collection of tax @ 1% on cash sales exceeding Rs.5 Lacs in case of bullion/ jewellery and Rs.2 Lacs in case of other goods/ services has been withdrawn since cash receipts exceeding Rs.2 Lacs have been made liable for equivalent penalty. The holding period of immovable property for being considered long term has been reduced to 2 years from earlier 3 years. Hence, Immovable property held for two years or more would attract a tax rate of 20% being long term capital gains. Base year for adjusting prices for inflation, has now been changed to April 1st 2001 from 1st April 1981. Income tax officials will be able to reopen the cases as old as 10 years, if search operations reveal undisclosed income and assets of over Rs.50 Lakhs. From July 1st2017, quoting Aadhaar Number will be mandatory while applying for a PAN Card as well as for filing Income Tax Returns.